- After a short artillery bombardment, the Germans at Ypres launch a second gas attack, releasing the deadly clouds to drift over the British and Canadian lines at and north of St. Julien. From 5am the Germans launch a series of heavy assaults on the battered 3rd Canadian Brigade. Gassed for the second time, it has reached the limits of its endurance, and under overwhelming pressure fall back. After midday they withdraw 700 yards south of St. Julien, yielding the village to the enemy. To the east 2nd Canadian Brigade, commanded by General Arthur Currie, has to pull back its left wing, much as 3rd Canadian Brigade had done two days earlier. The line at Ypres at midnight, April 24th, 1915, showing the ground yielded by 3rd Canadian Brigade today. Still, though the Canadian line bends and ground is yielded to the enemy, it does not shatter. Even though it is only two days since the first gas attack, already countermeasures are being improvised. Soldiers quickly learn that chlorine gas, heavier than hair, clings to the earth, and that remaining in low ground is fatal. Similarly, running from the gas, by making one breath more heavily, simply makes one more susceptible to its effects. Finally, cloths soaked in urine negate much of the effect of the gas. Though the chlorine gas still causes casualties, it is not the completely unknown terror it was on the 22nd. Never again will a gas attack have the same psychological impact. At Gravenstafel in particular, the Canadian 8th Battalion makes a valiant stand and, though heavily outnumbered, fights the Germans to a standstill, preventing a breakthough that could have swept behind the British 28th Division east of Ypres and unhinged the entire defence of the salient. Again, though the Germans have gained additional ground, they have not won a decisive success, and further Entente reinforcements are en route. 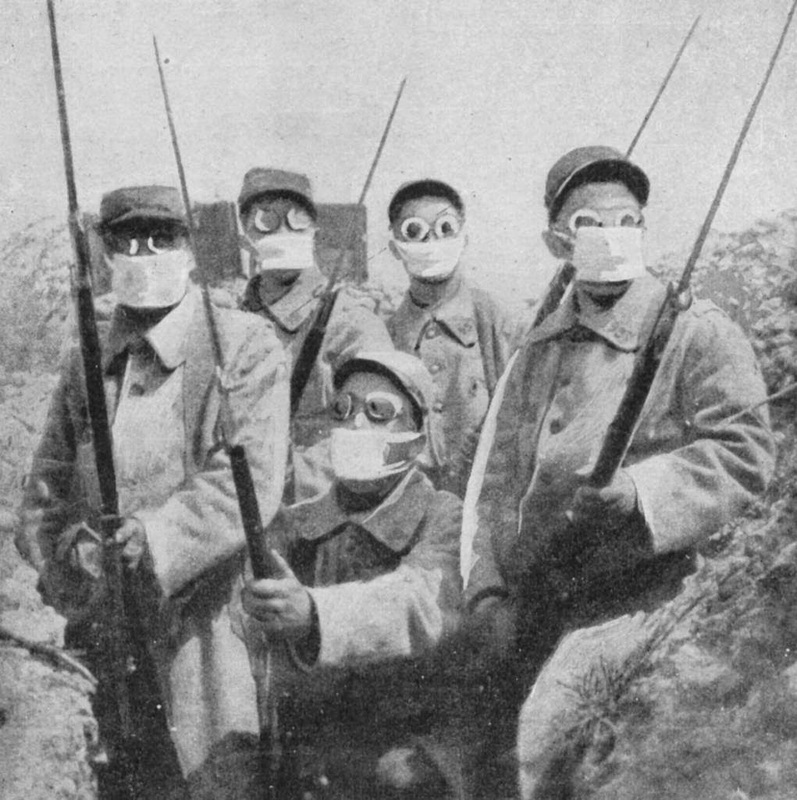 French soldiers using improvised gas masks in the 2nd Battle of Ypres. 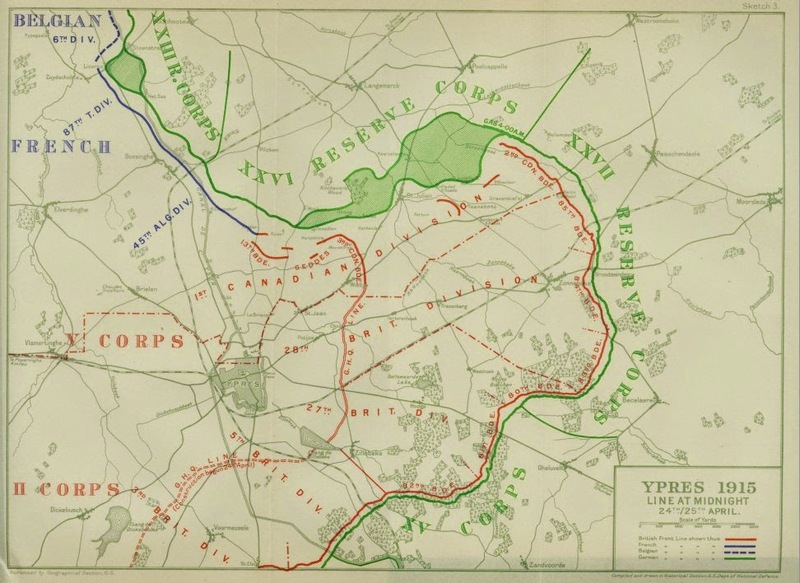 - In the St.-Mihiel salient the German counterattack shifts focus slightly to advance southwest of Les Éparges, and achieves a notable success: the capture of four kilometres of the French first trench line, two kilometres of the French second trench line, and even a battery of 75-mm artillery pieces. General Dubail of the Provisional Group of the East reports to Joffre that the German success was due to the profligate use of artillery and trench mortars. - At a meeting of the German and Austro-Hungarian leadership at Conrad's headquarters today, Chancellor Bethmann-Hollweg warns Foreign Minister Count Burián that the Austro-Hungarians can not count on any German military aid to fight Italy should the latter enter the war, and that such a circumstance could lead to defeat. The one hope those assembled cling to is that impending German offensive near Gorlice and Tarnow, if successful, will perhaps convince the Italians to hold back. The ongoing arrival of elements of the German 11th Army east of Krakow, April 24th, 1915. - Today the harbour at Mudros on Lemnos in the eastern Mediterranean is barely-controlled chaos as final preparations are completed for the landings on Gallipoli. One by one the transports leave the anchorage, bound for a rendezvous either at the island of Imbros or Tenedos. The two destinations are a reflection of the plan adopted by General Sir Ian Hamilton, which calls for two main landings to be undertaken tomorrow. The first, assigned to the ANZACs assembling at Imbros, is to land on the western side of the peninsula north of Gaba Tepe, where resistance is expected to be light. After securing the beaches the ANZACs are to advance eastward to control part of the Sari Bair range before seizing the hill at Mal Tepe and taking Kilid Bahr, the high point on Gallipoli, on the second day. Meanwhile, the British 29th Division and the Plymouth battalion of the Royal Naval Division, assembling at Tenedos, will be landing at a number of beaches around the Helles tip of the peninsula. Though these positions were known to be well-defended by the Ottomans, it is hoped that naval gunfire will be able to overcome resistance. 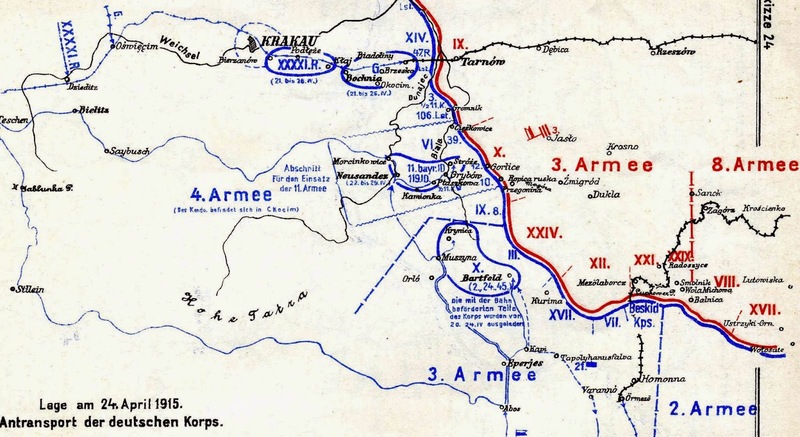 By the end of the first day these forces are to have seized the heights at Achi Baba behind the village of Krithia, and on the second will join the ANZACs in capturing Kilid Bahr. Once the high ground along the centre of the peninsula is seized, the Dardanelles coast can be clearing of enemy artillery and the minesweepers can finally complete their work. At the same time as the main landings, diversionary attacks will be made by the French at Kum Kale on the Asiatic shore and elsewhere to confuse and distract the Ottomans. It is a complex operation, and Hamilton hopes that by conducting so many landings simultanously the Ottomans will be unable to concentrate overwhelming force against any of them. In practice, what Hamilton has done is divided his own force such that none will be able to achieve its objectives. - Cevdet Bey reports to Constantinople today that the Armenian rebels in the city of Van number four thousand, have barricaded themselves in the Armenian quarter, and are proving impossible to dislodge. As artillery is brought in to bombard Van, the Ottomans allow fifteen thousand Armenian civilians escaping massacres in the countryside to join the besieged rebels. This is not done out of any sense of mercy, of course; rather, the hope is that the more mouths there are to feed in Van, the quicker they will all starve to death. With the rebellion continuing in Van, the Young Turk leadership moves to implement further measures against the Armenian population. Talat Pasha, the Minister of the Interior, issues orders for the arrest of all prominent Armenians in Constantinople, while Enver Pasha, the Minister of War, sends orders to army commanders in eastern Anatolia to deport the Armenian population in those regions where they are in open revolt. The key dispatch, however, is a second message written by Talat Pasha, sent to the commander of 4th Army in the Caucasus. The Minister of Interior states that deporting Armenians to the Konya region, as has been done in the past, is no longer feasible, since concentrating substantial numbers of Armenians in such a location would simply create further problems. Instead, those Armenians 'whose expulsion from places like Iskenderun, Dörtyol, Adana, Haçin, Zeytûm, and Sis has been deemed necessary, to the southeast of Haleb, Zor, and Urfa'. The vilyats named by Talat are to be found in the Syrian interior; in other words, Talat is ordering the Armenian population in the region of Van to be relocated into the desert and left to their own devices.